How to use Zapya or how to transfer files from one device to another is a good question. This question usually appears when someone want to trnasfer files from one device to another. First name that comes in mind is “Zapya File Transfer app”. Zapya is light weight app with basic functionality of file sharing and also has lot of fun in the app. File sharing is no longer a problem due to perfect solution provided by Zapya App. Its becoming a word of mouth for new users. For file transfer, some traditional ways include data trasfer using Bluetooth or using Data Cable. But this process is slow and with invloves cables. But Zapya on contrary provides best wireless and fastest solution for File transfer. User can send and receieve files from PC and smartphone, Zapya works for both Android and iOS users. Similarly, app can be used on PC and macbook, this is fully working. First, install Zapya app on each device, links are given above. Connect both devices with same Wi-Fi network. After installation, Create group in the App to send and receieve files. Now select files and tap on “Send” button. On the iOS device, you will first connect to the Wi-Fi network listed in Step 3, and then launch the Zapya app. 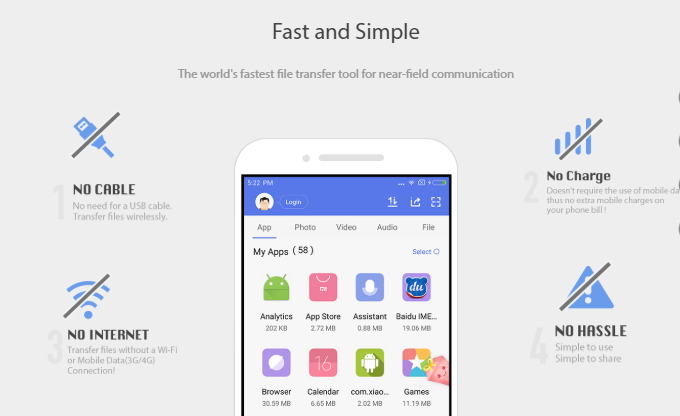 Both devices can send and receieve files, apps, music, videos, Photos and other files. Make sure you have installed app on both devices and ready to start. More details available on Zapya Blog. Zapya mini version is also available for those users who has low end devices. For slow phone zapyamini is best solution. However, desktop users can also try Zapya WebShare for fastest file transfer.